This beautiful little verrine of goodness was inspired by a salad I bought at Pret à Manger at the airport last week. To create the contrast between the beetroot and the Feta you should buy fresh, raw beets to boil and purée yourself. Pre-cooked beets won’t have the same vibrant colour. I think this dish would make a great starter for a dinner party or just a nice individual side salad to serve at a BBQ. Boil the beetroot, unpeeled in plenty of salted water with a glug of red wine vinegar. Cooking times will vary depending on the size of your beetroot but you should cook them until they are tender. You can check this using sharp knife. Cool the beetroot in cold, iced water then peel them by rubbing the skins off with your fingers under a running cold water tap. Blitz the beets in a food processor or with a stick blender, adding a pinch of salt and pepper and a dash of red wine vinegar. Set aside in the fridge to cool completely. Roast the pumpkin seeds on a baking tray in the oven at 180C for around five minutes, this will intensify their flavour and give the seeds a nice crunch. To assemble the salads take eight tumblers or small bowls, dividing the beetroot purée between each one. Then take 200g of Feta and crumble it in a pile on a chopping board. To divide the Feta into equal portions, divide the pile in two then each pile in two again (giving you four piles) then again to make eight small portions. 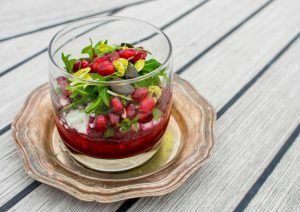 Top each tumbler with a portion of Feta, a few rocket leaves, some sprouts, some pomegranate seeds and some pumpkin seeds. Add some salt and pepper and a drizzle of olive oil and serve.